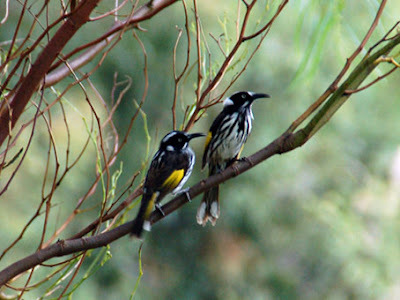 Around our place we have lots of these lovely birds called the New holland honeyeater. They are very quick and elusive to catch on camera. I have been attempting to get a good photo of them for a while and this has been the best so far. I often take photos of the different birds when I walk around the local lakes with Ethan. Go look over here, where I'm putting together a set of bird photos.